Desktop PCs, laptops and servers can quickly end up accumulating large quantities of unused, temporary, and duplicate files. Before you know it, you're out of drive space, backups are taking far too long to run, users can't find what they need, and you're struggling to plan for the future. Having a clear view of the items stored on the computer can be particularly useful when you have to decide what to delete to clear some space. 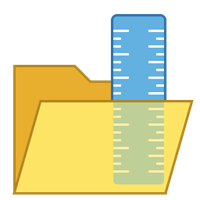 FolderSizes is a complex program with easy Interface that mixes together several tools. Eliminate temporary file clutter left over from software installs, downloads & browsing. Instant, at-a-glance view of any local, mapped, or removable disk. Discover which users are consuming the most space on local and network drives. Quickly isolate and manage duplicate files within any folder or volume. Discover and analyze network shares on servers, storage devices, or entire domains. View an entire sub-folder hierarchy at once with our folder map visualization. Save file system analysis results in XML format, and re-load them at a later date. FolderSizes meets all of the technical requirements to be Compatible with Windows 8. Use your own criteria to find old files that may no longer be needed. Scan and analyze multiple paths in a single pass (at the same time). FolderSizes is extremely resource efficient, incredibly fast, and ready for business.